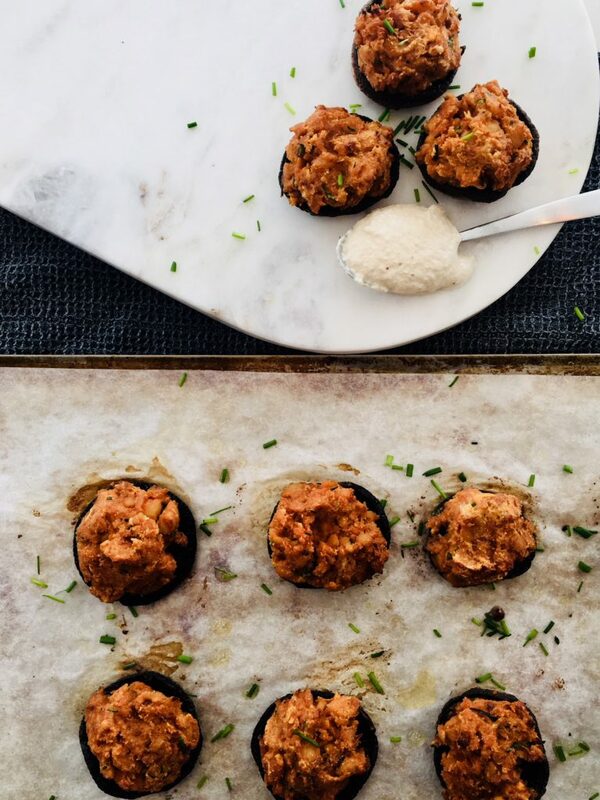 ﻿ TEMPEH STUFFED MUSHROOMS - I AM Co.
OK, these are pretty darn good. They almost didn’t get through the photo shoot. Clearly these are great for snacking, but you could easily make a meal out of them by using the large portobello mushrooms. This recipe makes extra cashew aioli so feel free to half it – or better yet, keep it in the fridge and use again on tacos, salads or sammies. Keeps for 2 weeks. 1. To make the cashew aioli place all the ingredients into a high powered blender (or food processor) and blend until it reaches a smooth consistency. You may need to scrap the sides with a spatula several times to get any lumps. Set aside. 2. Preheat the oven to 180 deg Celsius. Place the soy, smoked paprika, maple syrup, cider vinegar, oil and crumbled tempeh in a bowl and mix to combine. 3. Heat a frying pan and add tempeh mixture. Cook for 5 minutes or until fragrant. Remove from the heat and place mixture into a bowl. Add the sriracha, chives and half a cup of the cashew aioli then combine. 4. Place mushrooms on a oven tray and lightly brush with oil. Bake in the preheated oven for 10 minutes. Remove from the oven but leave the oven on. If excess moisture has collected in the mushrooms, use a paper towel to dry them out by dabbing. Stuff each mushroom with the tempeh filling and place back in the oven for 5 minutes or until slightly browned. Serve with an extra dollop of the cashew aioli. Enjoy!